I know that, but I do think any discussion about physical triggers has to include those triggers that aren’t going to be solved even in a month or two or those that will ever have an answer. These sicknesses run the gamut from terminal cancer to things like kidney disease and diabetes. On the one hand, it may appear that the chronic illnesses would be better than the terminal ones, but often even the chronic ones lead to fatal issues. I know that because my grandfather had diabetes. I was very young at the time, and so was he. He died at 66 of complications from the illness. I don’t know how or what those were. I’m not sure that anyone really does. What I do know is that he got very sick, and his body was fragile from the illness, and the sickness, whether tied to the illness or not, took him down. Further, so much of this discussion involves mental, emotional and spiritual defaults to the triggers of chronic and terminal illness. At first, the defaults may mimic those of a major illness. I know for some friends that a diagnosis of a chronic illness started out with many of the major illness defaults — trying to figure out what it was, thinking it would pass once they found a solution, praying yourself thought it, thinking in a month or so it would be over and they would go back to normal. Those kinds of things. But when the major illness turned chronic, the defaults shifted into coping. Figuring out how to live with THIS. Figuring out a new normal. New food. New patterns. New lifestyle. Figuring out new ways to deal emotionally, mentally, spiritually, and often physically with this new reality. And all of those “news” affect the whole family. Then people get put out because someone else’s illness is suddenly affecting THEM, and we have a whole raft of new issues to try to deal with. Sometimes it feels downright cruel. I have some friends who suffered through the loss of their mother to cancer. Not a word of that story was fair. Not one. Still, we all watched as the family drew closer together, holding each other as the time for passing came. We all prayed with them, held hands, and gave hugs. No fairness to be seen. But I think you’ve got to figure out what your defaults are in horrible too. Do you “run into the fire” or away from it? Do you know how to be strong and be there for people at the most difficult of times? I know. Not easy questions at all. Recently, I read a piece by a good friend of mine, Steve Biddison. It opened my eyes to how and why prayer especially in the most trying times of life is so incredibly important. The article is here: http://stevebiddison.wordpress.com/2014/06/27/what-does-it-mean-to-wait-on-the-lord/ and I HIGHLY recommend reading the whole thing when we’re done here. “They that wait upon the Lord shall renew their strength. They shall run and not grow weary. To bind, to tied yourself to. I’ve witnessed this very thing with people who are facing sicknesses that aren’t going to just go away. There is some “waiting,” some patience involved. But the ones who run the race, fight the good fight, and still keep the faith — they do more than just wait. They actively and consciously bind themselves to God. They pray. They ask for others’ prayers. As hard as it gets, they cling evermore tightly to God. I honestly don’t know what lessons God has for those of us who watch loved ones suffer. 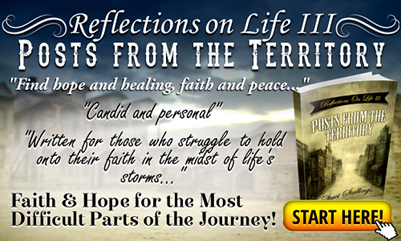 I don’t know if there are hidden truths for those who go through the suffering of chronic or terminal illness. However, from the outside looking in, I will tell you that the faith these families display in the face of such overwhelming grief could be described by no better word than inspiring. They literally put the Spirit in the middle of everything. They wait. They hope. They love. And in my opinion, those are defaults I think we’d all be better off to learn and use more often.